Reaching out from the undead, Pestilence is here to bring souls back to the underworld. 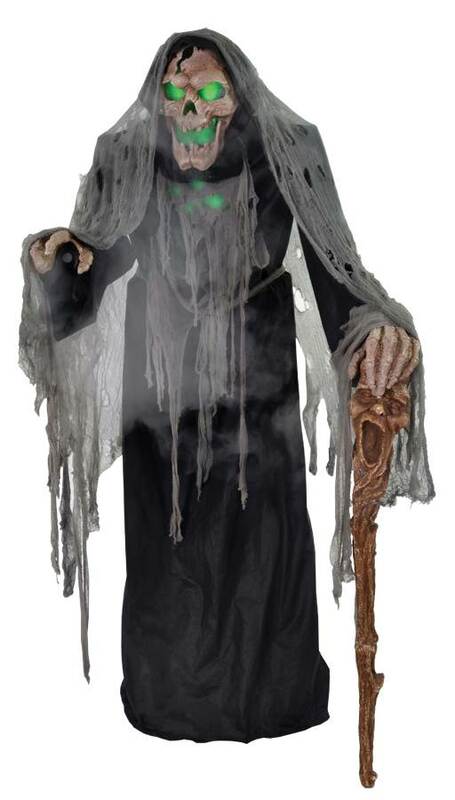 This Pestilence the Smoldering Reaper dons a tattered full black robe complimented by a grey ragged shred of fabric, a belt with 3 hanging plastic bones, hand-painted roto-PVC head, hand-painted roto-PVC hands & ribcage, and holds a 54"-long plastic cane. Plug in the UL adapter plug into any standard outlet for the head to turn side-to-side and to power the sensor. The sensor is light/shadow/motion sensitive and will operate the pulsing green LEDs within the skull & chest. Set your fog machine (not included) on the floor within his cloak & watch the fog flow eerily out from within the holes in his chest, arms & head. Measures 70'' tall. Sayings are: You shall know me for fillowing clow of plaque in my wake, for I am pestilence incarnate- approach and seal you doom! Smell the stench of death wrapping around you. I will pull you tightly into my embrace. With just one touch your health and vitality will be sucked from you forever. Please come closer!